Mr. Faragher is Arthur Unobskey Professor of American History at Yale University. He is the author of A Great and Noble Scheme: The Tragic Story of the Expulsion of the French Acadians from Their American Homeland (W.W. Norton, 2005). In December of 2003 the Canadian government announced that Governor-General Adrianne Clarkson, the Queen's representative in Canada, had signed a Royal Proclamation acknowledging responsibility for "the decision to deport the Acadian people" from the British province of Nova Scotia in 1755, and regretting the "tragic consequences." 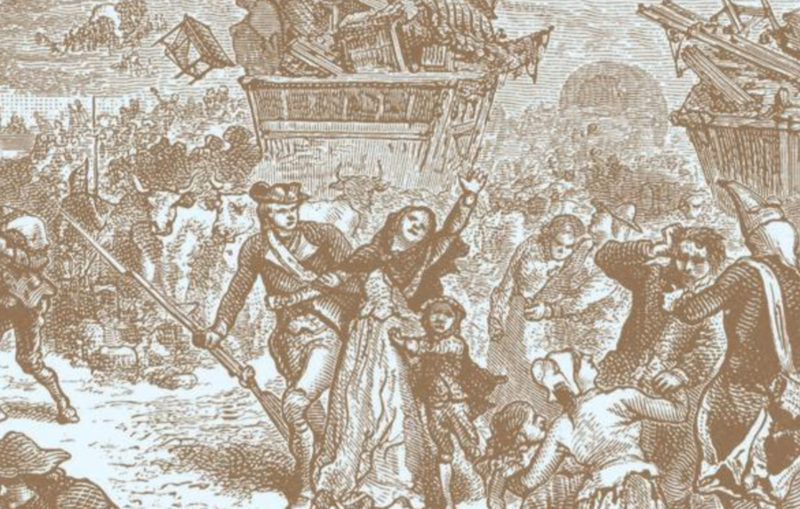 The story of the Acadian deportation is not pretty. During the late summer and fall of that year, troops acting under the authority of colonial officials systematically rounded up approximately seven thousand French-speaking, Catholic Acadians. They were crowded into the holds of transport vessels and dispersed in small groups throughout the British North American colonies. Many families were separated, some never to meet again. Another eleven thousand Acadians escaped into the woods and spent years as homeless refugees. At least three thousand were captured and sent to France, while others took up arms in guerrilla resistance. The campaign against the Acadians, which lasted until the end of the Seven Years War in 1763, claimed thousands of lives. Acadian property was plundered, their communities torched, their lands seized. After the war many of the surviving Acadians returned to the Maritimes, but not to their old farms on the Bay of Fundy, which in the meantime had been granted to English-speaking, Protestant settlers. Most of the surviving Acadians created new communities in what would become the province of New Brunswick, while several hundred others migrated to French Louisiana and became the ancestors of today's Cajuns. Why did this happen? What offense had the Acadians committed? They had refused to take an unconditional oath of allegiance, insisting on remaining neutral in the violent and destructive imperial warfare between the colonial empires of Great Britain and France. They were willing to swear loyalty to the British crown, they declared, but only with the inclusion of a condition: "that we will take up arms neither against his Britannic Majesty, nor against France, nor against any of their subjects or allies." British colonial authorities tactily agreed to those terms for nearly forty years, and the Acadians became known as "the neutral French." But in 1755, on the eve of what would prove to the climactic war with the French in North America, British authorities used Acadian neutrality as the pretext for their expulsion. A dispatch written in August 1755 by an anonymous correspondent in Nova Scotia and published in the British colonial press suggested larger motives. It is worth quoting in full. "We are now upon a great and noble Scheme of sending the neutral French out of this Province, who have always been secret Enemies, and have encouraged our Savages to cut our Throats. If we effect their Expulsion, it will be one of the greatest Things that ever the English did in America; for by all the Accounts, that Part of the Country they possess, is as good Land as any in the World: In case therefore we could get some good English Farmers in their Room, this Province would abound with all Kinds of Provisions." This amounts to a frank acknowledgement that the expulsion of the Acadians was a classic episode of ethnic cleansing. Compare the dispatch with the statement issued by a United Nations Commission of Experts, convened by the Secretary General in 1992 to investigate the violent conflict in the Balkans. "Ethnic cleansing," the commissioners concluded, "is a purposeful policy designed by one ethnic or religious group to remove by violent and terror-inspiring means the civilian population of another ethnic or religious group from certain geographic areas. To a large extent, it is carried out in the name of misguided nationalism, historic grievances, and a powerful driving sense of revenge. This purpose appears to be the occupation of territory to the exclusion of the purged group or groups." This definition could have been drawn from a study of the expulsion of the Acadians. Ethnic cleansing always has this dimension—one ethnic or religious group clearing away another by violent and terror-inspiring means, eager to seize their lands and possessions. Ethnic cleansing is nearly always a process of dispossession followed by repossession. The Acadians were never compensated for the losses incurred in what they called le Grand Dérangement—the Great Upheaval. Nor was there any official acknowledgement that they had been wronged. The British government, as well as several generations of historians, defended their expulsion as a "cruel necessity" in the war against France. But like many modern ethnic cleansing operations, the one aimed at the Acadians was carried out by officers of the government in accordance with a carefully conceived plan that had been years in the making, and included the seizure and destruction of Acadian records and registers, the arrest and isolation of community leaders, and the separation of men from women and children. The universal condemnation of ethnic cleansing by world opinion during the 1990s made it difficult to defend any longer what had been done to the Acadians. For more than a decade Acadian leaders sought an official apology from Queen Elizabeth. The Royal Proclamation issued at the end of 2003 was something of a compromise, not an apology exactly, but an acknowledgement of responsibility for the deportation. Euclide Chiasson, president of the Société Nationale de l'Acadie, which represents Acadian political and cultural groups throughout Canada, welcomed it nonetheless. "We finally have a document that recognizes the events surrounding that very sad part of our history," he told a press conference. Now, he said, "it's not only Acadian history, it's Canadian history." It was also American history. But it would have been hard to know that from reading newspapers in the United States, where the Royal Proclamation got practically no coverage. In the United States the history of the Acadian expulsion is known—if known at all—through Henry Wadsworth Longfellow's poem "Evangeline," which impressed several generations of Americans with its tale of Acadian suffering and survival. But the poem offered no hint of the important role Americans played in the removal. We ought to know the story of le grand dérangement better, for colonial Americans were the most prominent players in the planning and execution of the ethnic cleansing of the Acadians. The scheme was first proposed by William Shirley, the colonial governor of Massachusetts. It was authorized by the Nova Scotia Governor's Council, largely made up of men from Massachusetts. The campaign was executed by Yankee troops and Yankee officers, men fired by a burning hatred of the Catholic French. The Acadians were transported in Yankee vessels, with Yankee crews and captains, provisioned by Yankee merchants. And after the war the Acadian homeland was resettled by families from Connecticut, Rhode Island, Massachusetts, and New Hampshire. New Englanders were the principal schemers and beneficiaries Acadian removal, making this as much a part of the history of American expansion as the western movement of settlers beyond the Appalachians and across the Mississippi, a movement that also involved the removal of many peoples. The British and Canadian government have now acknowledged their responsibility for the wrong done to the Acadians. The role of New Englanders as the perpetrators in this episode of ethnic cleansing suggests that Americans ought to reflect on the larger context of our national history. I am an English Canadian (descended from Irish potato famine refugees) from Ontario and I have been living for the last year in the heart of Acadia - in a little french town north of Dieppe NB. My sister-in-law is Acadian and she has educated me on the plight of her people. If you want to know where the acadians ended up - it was on the lower quality property that lines the sea. Once you go inland and see farmland you see english farmers. You always know that you are in Acadia because Acadians very proudly display their flags (a french flag with a gold star) outside their homes. Also this summer marked the 250th anniversary of the expulsion so there was much activity here to commemorate that event. You may not realise this but the french in Quebec are not descended from Acadians - they come from a different part of France altogether. And the license plate in Quebec says "Je me souviens". Je me souviens que né sous le lys, je croîs sous la rose. It means "I remember that I was born under the lily but now live under the rose". The lily represents France and the rose represents England. Thank you for taking the time to respond. Most who attend the ongoing dialogue at HNN really appreciate when an author defends his piece against our scurrilous attacks. My intent is not to dismiss the plight of the Acadians and your response regarding Annapolis Royal is quite true when taken as a snapshot. My intent is more to diffuse the blame you seem intent to place. It's not that simple. The deportation of thousands of Acadians, however was not the result of one incident, one letter, one attitude, or even one set of circumstances. More importantly, you made it a point to mention how settlers from Maine, Vermont and New Hampshire were willing participants in what the rather provocative title called, "ethnic cleansing". That is the crux of my objection. That is the reason I included the Livingston diary remarks about that (not unusual) incident which goes back a half-century before the time and treaties you've referred to. Those settlers should not be held to a burden of proof they couldn't possibly apply, or be asked to distinguish among the French vernacular and French antecedants of perceived enemies they'd been taught to fear and hate. Acadia was populated by a diverse mix along with the majority Acadian-French - there were Scots and even Portugese living in those disputed lands. You will also note that French intermarried with the Acadians. Louis du Chambon, Governor of the French fortress of Louisbourg, was half Acadian or married to an Acadian - I can't remember which - and other members of the French Canadian hierarchy married Acadian women for at least fifty years. If the bloodline you insist was separate and victimized was nearly indistinguishable to a 1750 Frenchman, how can you expect English-speaking colonists from some backwoods settlement near Moosehead Lake to tell the difference? I think the deportations were based purely on a greedy land-grab and ethnicity only played a minimal part, if any at all, so British politicians could manufacture an acceptable excuse in retrospect. The simple fact is there was never any Acadian complicity in Canadien and native attacks on New England. The relevant case is the conduct of the Acadians during King George's War during the mid-1740s, when French, Canadien, and Mikmaw forces invaded Nova Scotia and besieged the British garrison at Annapolis Royal. The vast majority of Acadians refused to join the attack. The acting British governor, Paul Mascarene, testified that by maintaining their neutrality the Acadians had effectively demonstrated their loyalty. He cited the statement their leaders had made to the French commander in October 1744. "We hope," they had written, "that you will not plunge both ourselves and our families into a state of total loss, and that this consideration will cause you to withdraw your sauvages and troops from our districts. We live under a mild and tranquil government, and we have good reason to be faithful to it. We hope, therefore, that you will have the goodness not to separate us from it; and that you will grant us the favour not to plunge us into utter misery." British colonial officials chose to ignore the Acadian history of neutrality and pursue their expulsion for reasons other than the security of the region. True, but my intent was to show motivation for the apparent hatred of "French Canadians" in the mid 1700s. With our modern knowledge, we can differentiate between certain ethnic strains and places of origin. Colonists of the 18th Century did not have such resources, but had to rely on the verbal traditions passed down by parents and grandparents. We can tell the difference, they may not have been able - or may not have cared. The purpose for including 1690 Schenectady with the mid 1700 incidents was to show a long-term pattern and to show that the same raiders also raided Maine and New Hampshire at the same time with similar bloody results. The Canadian Provinces bordering Maine and New Hampshire are New Brunswick and Quebec. Not all French settlers in north America are the same. Acadia was not Quebec. It was to the East. The notion that Acadians were reponsible for the attack on Schenectady seems remote. If you could demonstrate Acadian complicity, your point would be stronger. Hit the space bar too soon. Mr Faragher gives us an atrocity without cause. That was not the case. Justified or not, English settlers felt the French had incited Indian massacres as far back as the late 1600s (Above post) and such massacres of civilians and surrendered soldiers as those at Fort Osage and Fort William Henry to mention a few. These were characterized by the presence of French Regular troops while allied Indians carried out the butchery. The tell tale words in this article are "...a great and noble Scheme of sending the neutral French out of this Province, who have always been secret Enemies, and have encouraged our Savages to cut our Throats." Robert Livingston's account of an attack by the French and their Indian allies on the Dutch/English settlement at Schenectady in New York on February 8 and 9, 1690 follows three paragraphs below. The attack was retaliation for a series of devastating Iroquois raids on Canada, and was an attempt to punish the English for supplying arms and ammunition to the Iroquois and to bolster the morale of French Canadians and western tribes with an easy victory since the Iroquois were impossible to defeat. Approximately 60 people were killed in the raid on Schenectady (including 10 women and 12 children) and between 80 and 90 were taken prisoner. The Schenectady raid was part of a three-pronged French attack on isolated northern and western settlements. The others were Salmon Falls, New Hampshire, where 30 were killed and 54 prisoners were tortured to death and Fort Loyal (today, Portland, Maine), where all the inhabitants were killed or taken prisoner. The women and children fled mostly into the woods, almost naked and there many froze to death...."
I am a dual US-Canadian citizen so have a special interest in the Acadian action around 1755. I see it as just another examples of 'hidden history' where govts that claim to be 'nice' (don't they all) were guilty of murder, and theft. Killing 'indians' and wars of conquest (Mex-Amer, Span-Amer, 1812, etc) are similar. Then there are the phony reasons for started wars, which in fact had a hidden agenda where our 'leaders' wanted war (Vietnam-Tonkin, WW2-Pearl Harbor, etc). Then there was the phony explanation of the US Civil War. It wasn't about slavery, it was due to N states abusing S states by forcing them to buy N manufactured good by passing excise taxes, using the N state majority vote in DC. Then we have the Balkans and Afhgan. wars (oil) and Iraq, (Israel and oil). What's new !! !